Punti Necessari: 1750 Please note that, for now, you cannot download content from our platform directly onto a mobile device (phone, iPod, iPad, tablets...). You need to download your items onto a PC or Mac, and then transfer them onto your device in the normal way. We are working on allowing direct downloads to mobile devices but this is not possible in the current version of the platform. Sorry about the inconvenience! ABOUT THE GAME	In the ‘50s Rock’n’Roll music was spawned straight from hell and was so evil that it turned dead people into Zombies! Three survivors - Jack Foster, a construction worker, Foxy Jones, a traffic warden, and Mike Bacon, a perpetually hungry boy scout - have formed an unlikely alliance to protect themselves from the invading undead. Hiding from the Zombies in abandoned build… ings, they build blockades, set traps and – as a last resort - use weapons to fight. 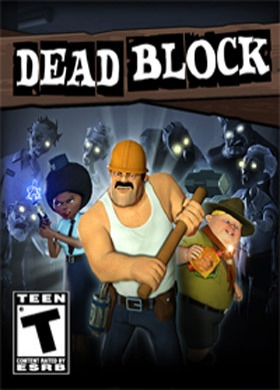 KEY FEATURES A humoristic gameplay mix of killing zombies and tactical defense. Kill zombies in unusual and entertaining ways: install unique traps, employ devious tactics and fight the intruders with smart bombs and melee weapons. Tactical defense gameplay: defend from zombies by building blockades, gathering resources and switching between all 3 characters.SYSTEM REQUIREMENTS Minimum: CPU: AMD/Intel single-core processor running at 1.7GHz RAM: 512MB for MS Windows XP and 1024MB for MS Windows Vista/Win7 GPU: ATI/nVidia graphic card with at least 128MB of dedicated VRAM and with at least DirectX 9.0c and Shader Model 3.0 support. ATI Radeon series 2xxx and NVIDIA Geforce series 7xxx are the minimum supported graphic cards. The game also works on Intel integrated graphics chipsets, the minimum chipset is Intel GMA x4500. Sound: Integrated or dedicated DirectX 9 compatible soundcard OS: x86 or x64 bit versions of Microsoft Windows XP/Vista/Win7 Other: keyboard, mouseRecommended: CPU: AMD/Intel dual-core processor running at 2.5 GHz RAM: 1024MB for MS Windows XP and 2048MB for Vista/Win7 GPU: ATI/Nvidia dedicated graphic card with at least 512MB of dedicated VRAM and with at least DirectX 9.0c and Shader Model 4.0 support. ATI Radeon HD 3850 and NVIDIA Geforce 8800GT are recommended graphic cards. Sound: Integrated or dedicated DirectX 9.0c compatible soundcard OS: x86 or x64 bit versions of Microsoft Windows XP/Vista/Win7 Other: keyboard, mouseWith regards to the Windows Experience Index, the game will work on a system with a base score of 3.0, but a rating of 4.5 is recommended in order to fully enjoy the game.